Join the legendary hero Indiana Jones (Harrison Ford) in one of the greatest screen adventures of all time with Indiana Jones and the Raiders of the Lost Ark (Disc 1). Accompanied by his feisty, independent ex-flame Marion Ravenwood (Karen Allen), the two-fisted archeologist embarks on a thrilling quest to locate the mystical Ark of the Covenant. Indy must discover the Ark before the Nazis do, and he has to survive poison, traps, snakes and treachery to do so. Explore the darkest jungles of South America, the bustling marketplaces of Cairo, and a top-secret submarine base with Indiana Jones as your guide to adventure. $8.305 million on 1078 screens. Back when Raiders of the Lost Ark hit screens in 1981, I felt no desire to see it. For reasons I no longer recall, my then-14-year-old self thought Spielberg movies seemed uncool, and I greatly resisted the movie. I only went because my Dad touted it heavily and basically made me go. Score one for the Old Man! I knew very little about Raiders before that screening and became totally enraptured with what I saw. Whatever I did or didn�t expect, I surely couldn�t anticipate this, a rollicking adventure that seemed like the perfect movie. 22 years later, I still find it hard to dispel the notion that Raiders offers a virtually flawless flick. Set in 1936, we meet adventurer Indiana Jones (Harrison Ford) during a lively sequence in which he nabs an ancient artifact from a South American cave. Back in the States, we learn that Indy also maintains a day job as an archaeology professor. However, his adventures frequently take him from the classroom, and when representatives of the US government come a-calling, he gets a new assignment to seek one of the greatest artifacts of all: the Lost Ark of the Covenant. It seems that Hitler thinks the Ark possesses magical powers, so he orders his forces to pull out all the stops in their hunt for it. The US leaders don�t want that to happen, so they recruit Indy as the best man to beat the Nazis to the punch. His first stop? Nepal, where he goes to find a medallion that will help him find the alleged burial spot of the Ark. This rouses some old concerns, however, as he runs into Marion Ravenwood (Karen Allen), the daughter of his former partner and also an old � and jilted � flame. Despite their problematic past, the pair become a team in the search for the Ark and head to Egypt, where Indy reunites with an old friend and local helper named Sallah (John Rhys-Davies). On the Nazi team against them we find Belloq (Paul Freeman), a mercenary French archaeologist we previously met at the start of the film. He heads a team that includes a diabolical enforcer named Toht (Ronald Lacey) and other nasties. The movie follows the race between the two groups to discover the Ark and deal with it if this happens. One cannot overstate the impact Raiders made on movies back in 1981. It presented a genuine breath of fresh air, a lively and endearing flick that pounded on the viewer with relentless action. However much it battered us, however, we eagerly came back for more. If ever a movie merited being called a �rollercoaster ride�, it was Raiders. Critics will knock Raiders as unoriginal, and it�s certainly true that the film doesn�t present anything particularly innovative. Really, as the filmmakers gladly admit, it gleefully offers a modern version of the old movie serials of the Thirties and Forties. Raiders is nothing more than a cliffhanger without the wait between episodes. However, originality is severely overrated. As an overrated flick like Nashville establishes, just because you do something different doesn�t mean the results actually seem interesting. Execution proves much more important than innovation. Maybe Raiders didn�t tread any new ground, but it explored its subjects so incredibly well that it felt fresh. Make no mistake: in 1981, most of us had never seen a movie like Raiders. Director Steven Spielberg creates the ultimate expression of the adventure flick with an ideal hero and briskly paced action that grabs the viewer and never lets go. The film�s opening sequence remains possibly its most famous, and it perfectly sets the stage for what will come. A series of �how can things get worse?� challenges, it gets the ball rolling � pun intended � terrifically. Few movies have opened with such an amazing sequence. That doesn�t mean it�s all downhill from there, as Raiders presents a terrific succession of action bits that all seem to top each other. Viewed objectively, none may seem quite as stellar as that opening, but the film nonetheless comes chock full of exciting and rousing moments. Don�t take Raiders to be nothing more than a random collection of action set pieces without anything interesting to connect them. 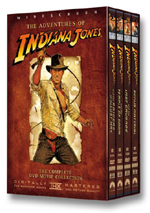 The film presents a great roster of characters, all headed by Indy himself. Ford was already famous for Star Wars, but here he becomes a true movie star. The first � and really only � actor to break out of the typecasting caused by the 1977�s classic�s success, Ford�s work as Indy showed that he could do more than pilot a starship. Indy makes him more of a classic action hero; without it, I don�t know if he ever would have become the megastar that he now is. Indy remains the perfect hero. He�s one of those guys the women all desire and the men admire. He doesn�t play better for one circle or another, as across the board, Indy seems irresistibly and unselfconsciously charming. I don�t know if anyone but Ford could pull off my favorite moment in Raiders. After one extended battle that leaves him battered, Sallah tells Indy that the Nazis put the Ark on a departing truck. Despite his exhaustion and sores, Indy slaps his glove and resolutely asks, �Truck? What truck?� This is a hero who won�t give up but who seems delightfully human all the while. Ford doesn�t carry the movie alone, of course, and the film�s supporting characters certainly embellish it. Allen�s Marion offers a terrific heroine. Bluntly beautiful but not prissy, she seems spunky and smart and becomes a perfect match for Indy. Has any female lead in an action flick gotten a better introduction than her drinking contest? Add to that Rhys-Davies� understate and charming take on the stereotypical sidekick, Lacey�s insidious performance as the leering Toht, and Freeman�s glibly slick but nicely three-dimensional interpretation of the mercenary and you have a great roster of supporting personalities. All make the movie more real despite its cartoony origins, and they become important reasons for its success. I could go on and on about the magic that is Raiders of the Lost Ark, but I�ll stop there. Suffice it to say that it continues to present a virtually flawless piece of cinematic entertainment. It dazzled me when I first saw it 22 years ago, and it still knocks me out today. 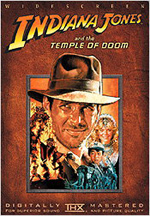 Raiders of the Lost Ark appears in an aspect ratio of approximately 2.35:1 on this single-sided, double-layered DVD; the image has been enhanced for 16X9 televisions. Given the film�s stature, I hoped for a killer transfer. Alas, the end result was more inconsistent than I�d anticipated. Sharpness was one of the erratic elements. Much of the film showed good delineation, but more than a few soft shots appeared. Noticeable edge haloes caused some of these, and a mix of scenes looked a bit blocky. No issues with shimmering occurred, but edges could be slightly rough at times. As for print flaws, the transfer appeared totally free of them. I never noticed any form of defect, and the movie consistently looked smooth and clean. Colors also seemed up and down. Most of the film exhibited fairly solid tones, but matters could look a little orange at times, particularly in regard to skin tones. Otherwise, the hues appeared pretty positive. Blacks were dense and deep, and shadows appeared nicely delineated and concise. Though parts of the transfer worked quite well, the inconsistencies left this one as a "B-". Let me provide two additional notes related to the transfer. 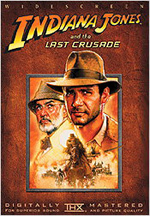 First, many will note that the DVD�s case refers to this film as Indiana Jones and the Raiders of the Lost Ark. 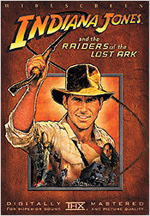 Personally, I refuse to use that alteration of the original title, and I�m happy to report that the folks at Lucasfilm didn�t tamper with the credits on this DVD; it still comes billed just as Raiders of the Lost Ark. One bit of digital noodling does occur, however, during the scene in which Indy falls among all those snakes. In the original movie, one could easily see Ford�s reflection in the barrier that kept him from one of the critters. The DVD uses technology to erase that impression. It does so smoothly and works well. While not quite on a standard with modern mixes, the Dolby Digital 5.1 soundtrack of Raiders of the Lost Ark seemed splendid for its age. The movie employed an almost shockingly active soundfield that presented a great deal of auditory information. The score enjoyed solid stereo imaging, and the track offered much localized material. At times some of this seemed a little too localized, as a few elements didn�t mesh together terribly well, but those instances appeared minor. For the most part, the mix featured a lot of different auditory pieces that were placed appropriately in the environment. These included a lot of elements from the rear speakers. Usually these stayed monaural, but I was surprised to note some definite stereo surround usage on a few occasions. For example, during the runway fight, a plane zoomed distinctly from left to right in the rear, and the shots on the dock as Indy and Marion prepare to board the boat also featured unique elements in the two back speakers. Whether mono or stereo, the surrounds added a great deal of information to the track, and they helped make it an engulfing affair. Audio quality slightly showed it age but usually seemed very positive. The dialogue occasionally was a little hollow, and I noticed periodic examples of awkward looping. Nonetheless, the lines betrayed no signs of edginess, and they mostly sounded natural and distinct. John Williams� rousing score came across as bright and dynamic, with great definition for the various parts. Effects also showed a bit of thinness, but not often. The various elements mostly seemed accurate and concise, and those pieces presented surprisingly vivid low-end. The bass of Raiders packed a real punch and helped bring a lot of life to the mix. In the end, this became a well above average track for a flick from 1981. Almost no supplements appear on the disc for Raiders. We find nothing more than a link to an exclusive DVD website and the THX Optimizer, a program to help you configure your home theater. 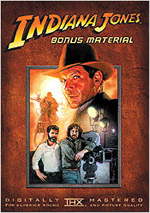 However, this edition of Raiders comes only as a part of a four-disc package called The Adventures of Indiana Jones. This set includes all its extras on the fourth DVD. Because of that, I didn�t issue a grade for the special features, as I reserved that judgment for my article that covers the fourth disc. More than 25 years after its debut, Raiders of the Lost Ark remains one of the greatest movies ever made. It absolutely defines the action adventure and presents a virtually perfect piece of excitement. Audio seems very good, but picture is erratic and not as strong as I�d like. Nonetheless, movies don�t get any better than this, so Raiders of the Lost Ark comes with my highest recommendation.